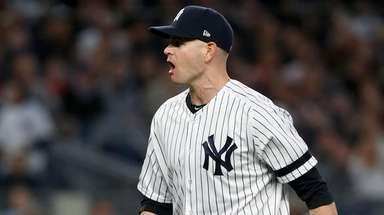 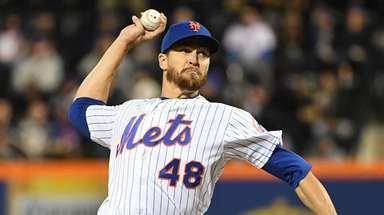 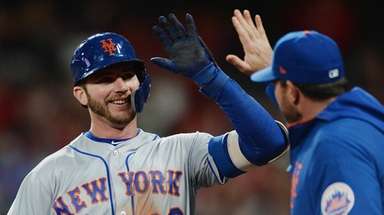 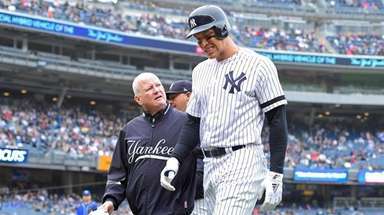 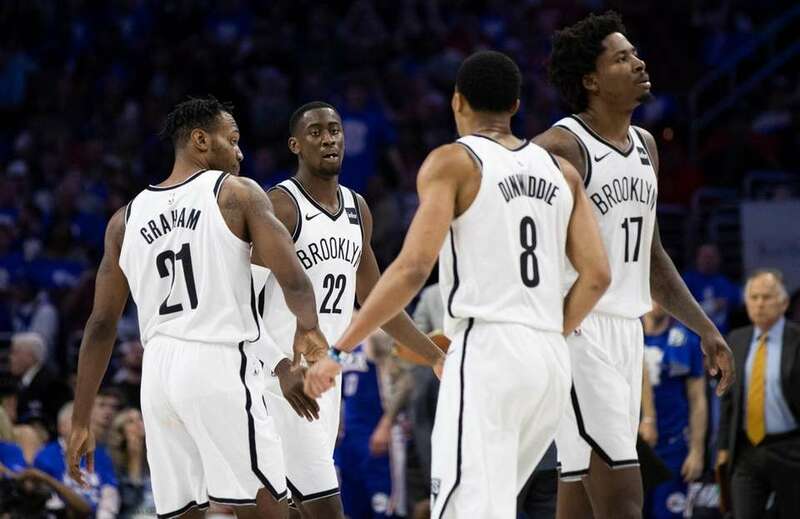 The Nets played the Philadelphia 76ers in the first round of the NBA playoffs on Saturday, April 13, 2019, at Wells Fargo Arena in Philadelphia. 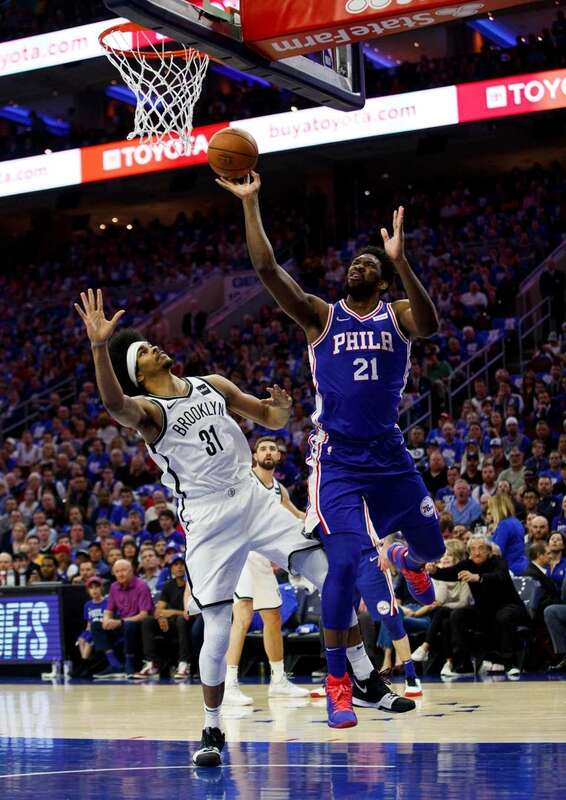 The 76ers' Joel Embiid, left, shoots over the Nets' Jared Dudley, right, during the second half in Game 1 of a first-round NBA playoff series, Saturday, April 13, 2019, in Philadelphia. 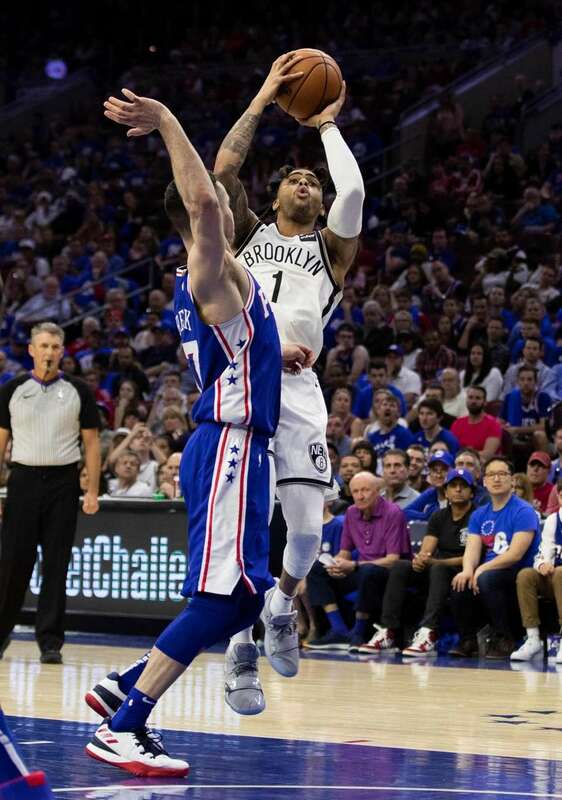 The Nets' D'Angelo Russell, right, shoots the ball and draws the sixth foul on the 76ers' JJ Redick, left, during the second half in Game 1 of a first-round NBA playoff series, Saturday, April 13, 2019, in Philadelphia. 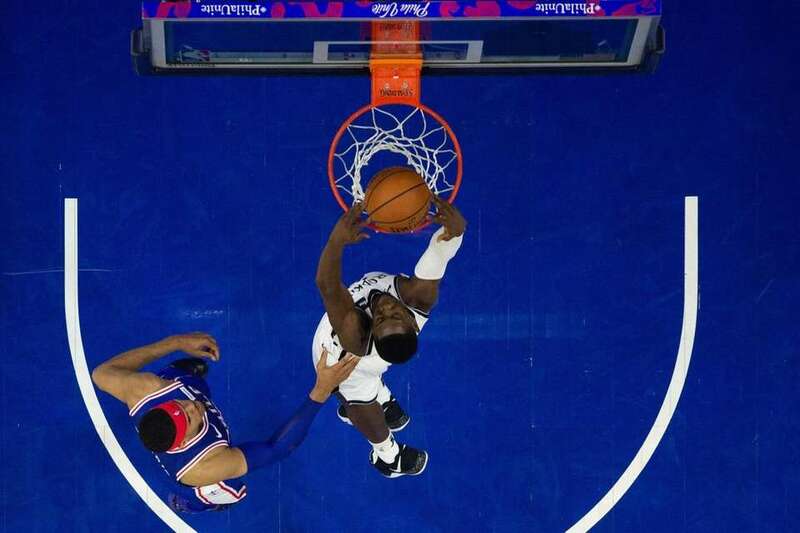 The Nets' Caris LeVert, left, dunks the ball as the 76ers' Tobias Harris, right, looks on during the first half in Game 1 of a first-round NBA playoff series, Saturday, April 13, 2019, in Philadelphia. 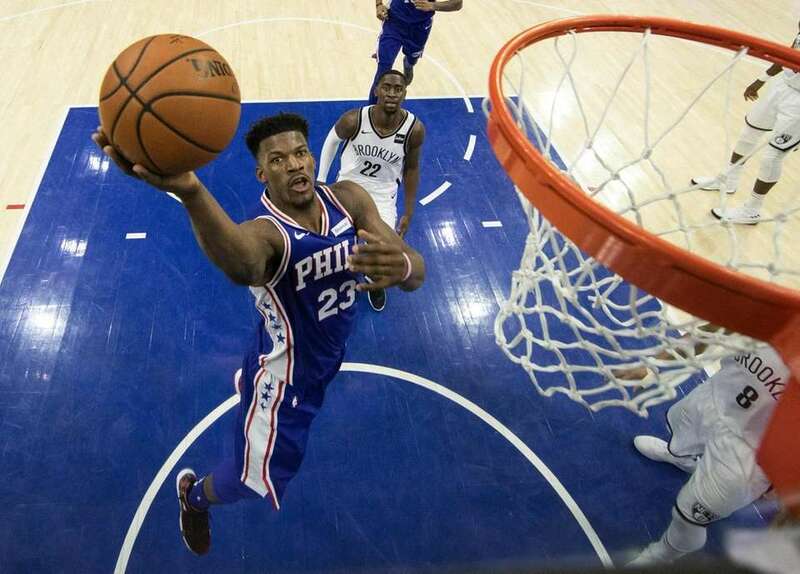 The 76ers' Jimmy Butler puts up the shot during the second half in Game 1 of a first-round NBA playoff series against the Nets, Saturday, April 13, 2019, in Philadelphia. 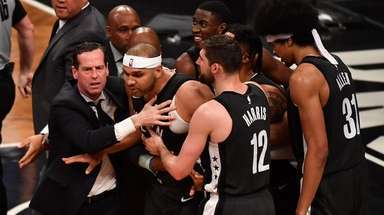 The Nets' Caris LeVert, center left, celebrates with his teammates during the second half in Game 1 of a first-round NBA playoff series against the 76ers on Saturday, April 13, 2019, in Philadelphia. 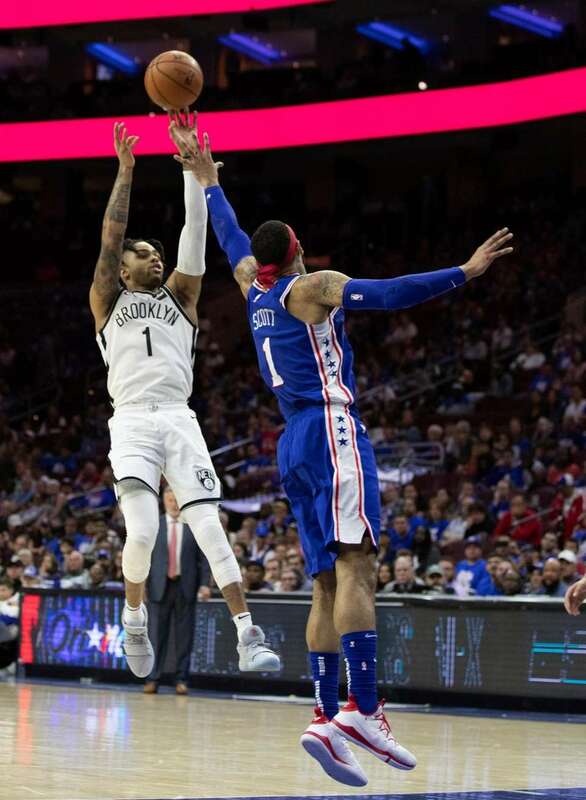 The Nets' D'Angelo Russell, left, shoots over Philadelphia 76ers' Mike Scott, right, during the second half in Game 1 of a first-round NBA playoff series, Saturday, April 13, 2019, in Philadelphia. 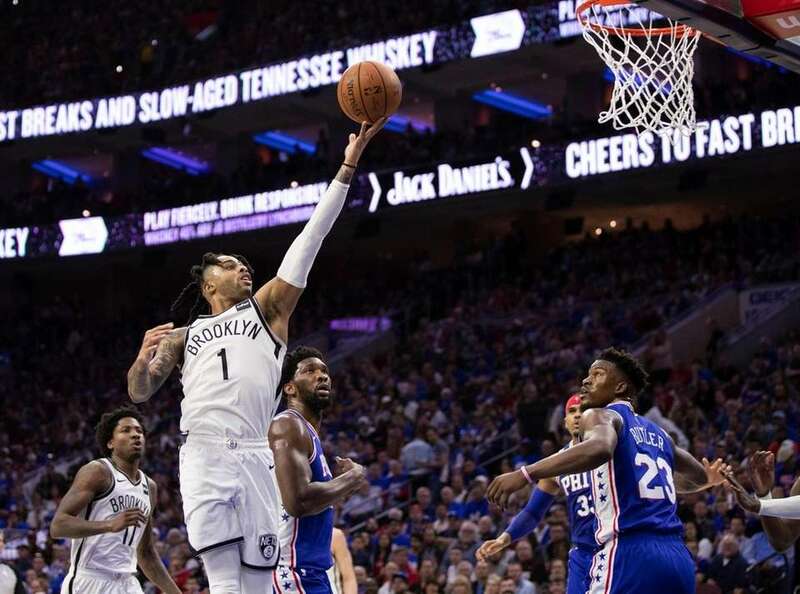 The Nets' D'Angelo Russell, left, goes up for the shot as he gets past the 76ers' Joel Embiid, center, of Cameroon, during the second half in Game 1 of a first-round NBA playoff series, Saturday, April 13, 2019, in Philadelphia. 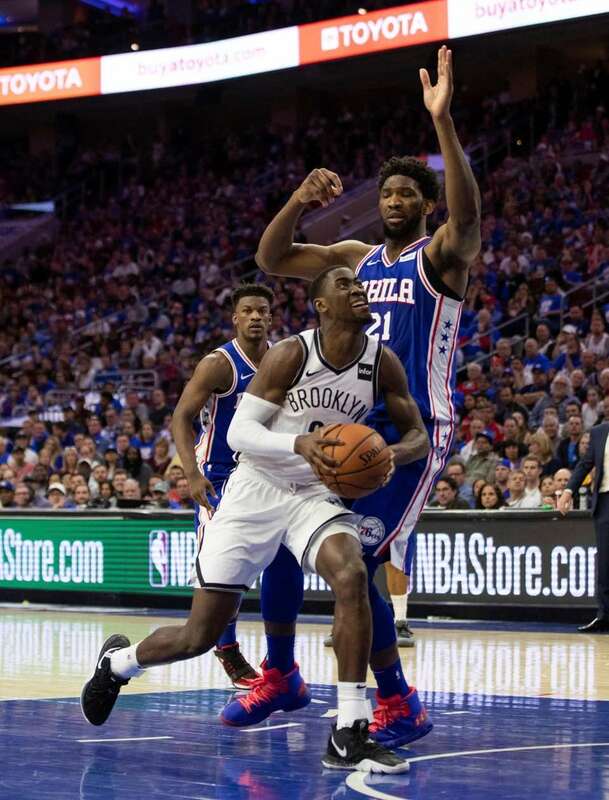 The Nets' Caris LeVert, left, drives to the basket against the 76ers' Joel Embiid, right, during the second half in Game 1 of a first-round NBA playoff series, Saturday, April 13, 2019, in Philadelphia. 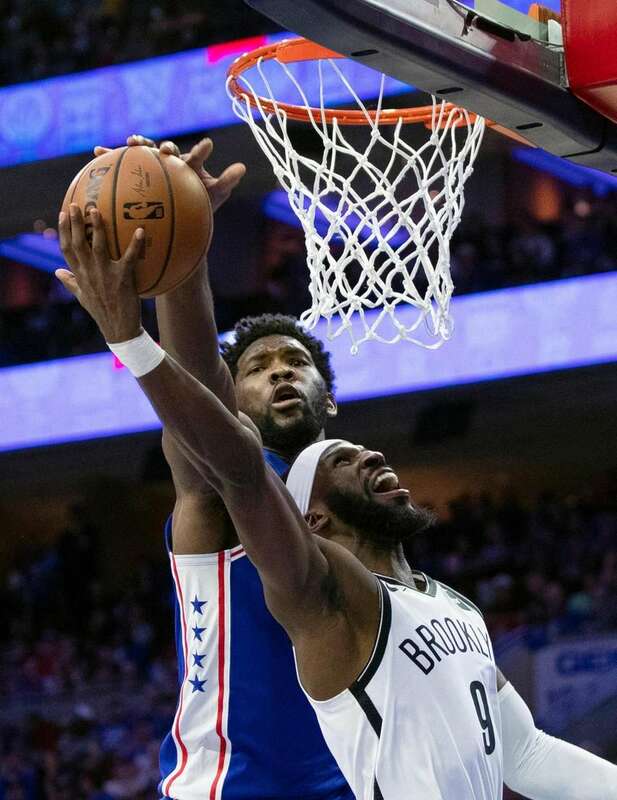 The 76ers' Joel Embiid, top, blocks the shot by the Nets' DeMarre Carroll, right, during the second half in Game 1 of a first-round NBA playoff series, Saturday, April 13, 2019, in Philadelphia. 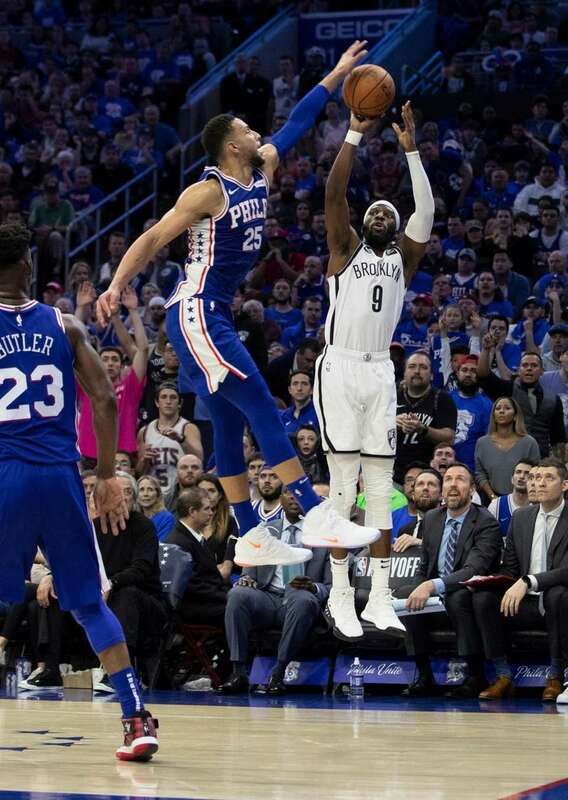 The 76ers' Ben Simmons, left, leaps to block the shot by the Nets' DeMarre Carroll, right, during the second half in Game 1 of a first-round NBA playoff series, Saturday, April 13, 2019, in Philadelphia. 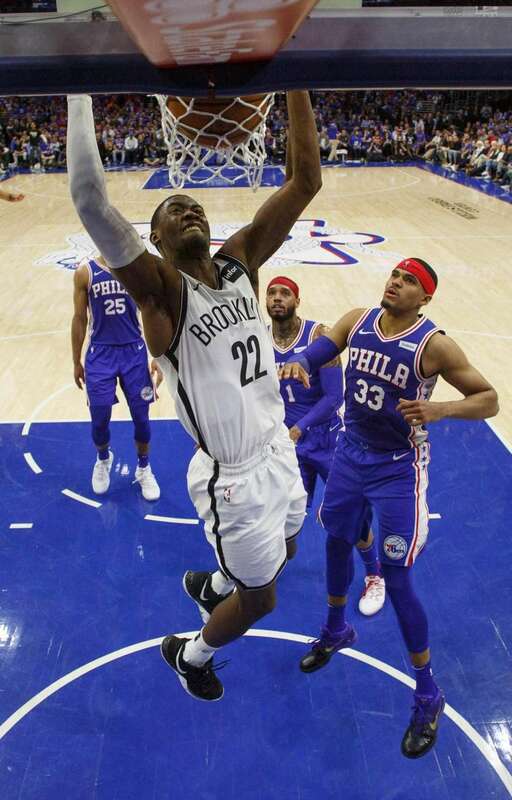 The Nets' Caris LeVert, right, dunks the ball as the 76ers' Tobias Harris, left, defends during the first half in Game 1 of a first-round NBA playoff series, Saturday, April 13, 2019, in Philadelphia. 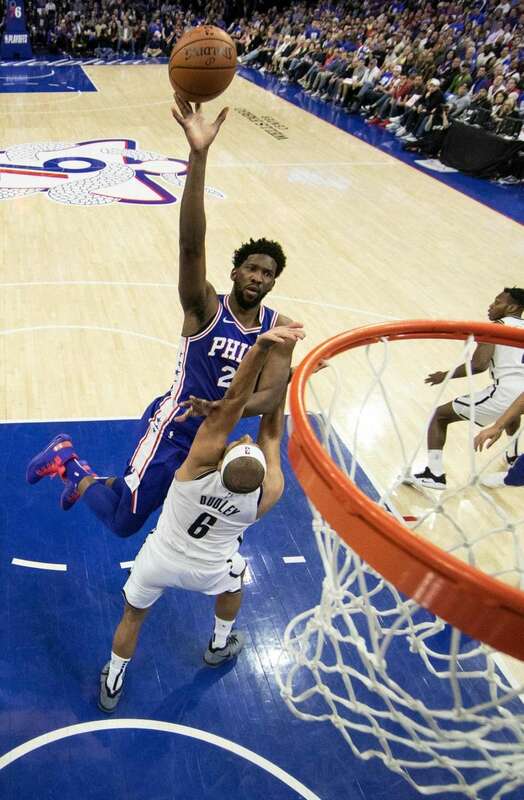 The 76ers' Joel Embiid, right, puts up the shot as he is fouled by the Nets' Jarrett Allen, left, during the first half in Game 1 of a first-round NBA playoff series, Saturday, April 13, 2019, in Philadelphia. 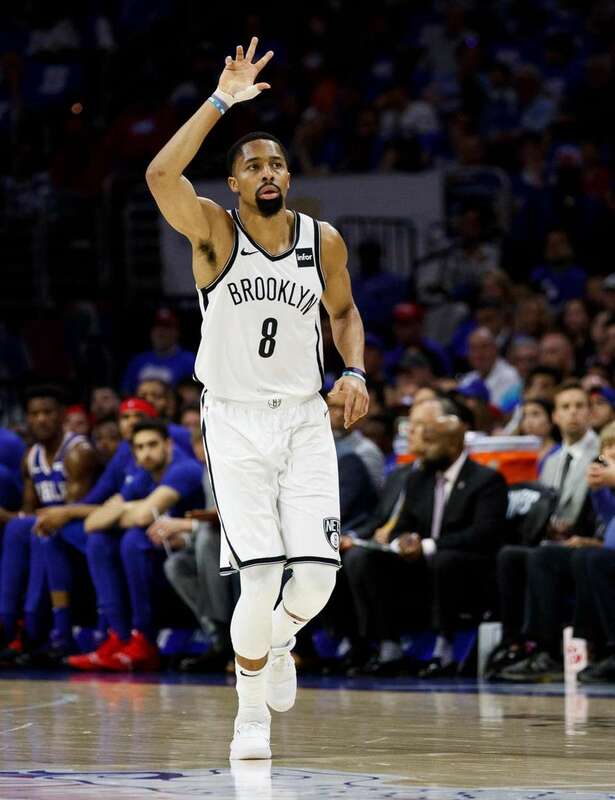 The Nets' Spencer Dinwiddie reacts to his three-point basket during the first half in Game 1 of a first-round NBA playoff series against the 76ers on Saturday in Philadelphia. 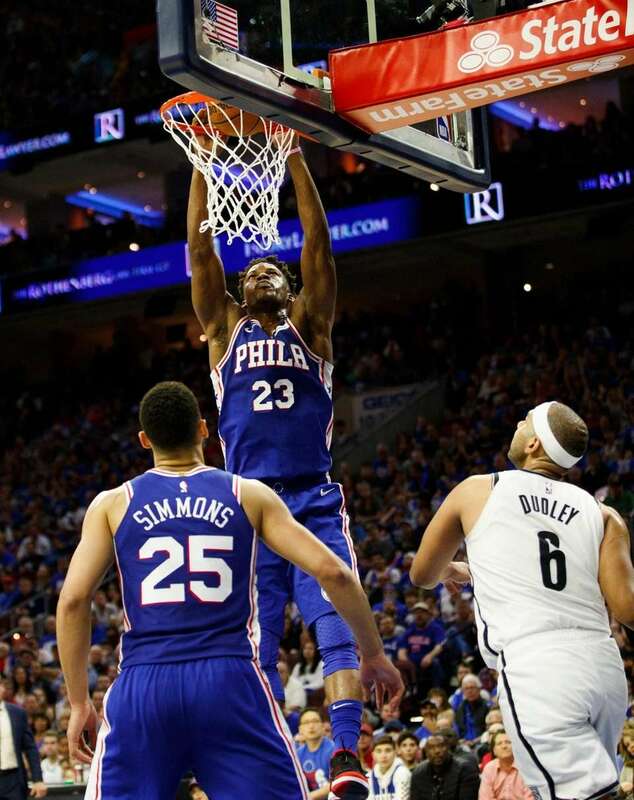 The 76ers' Jimmy Butler, center, dunks as Ben Simmons, left, and the Nets' Jared Dudley, right, look on during the first half in Game 1 of a first-round NBA playoff series, Saturday, April 13, 2019, in Philadelphia. 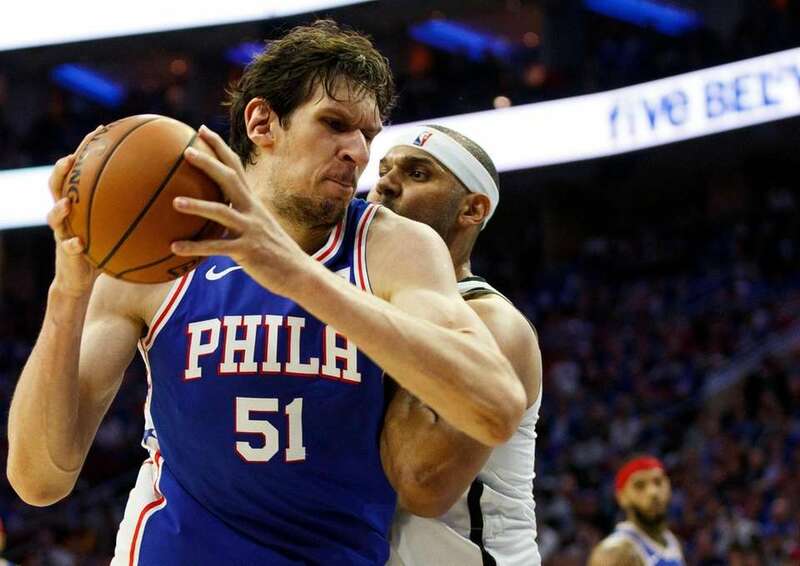 The 76ers' Boban Marjanovic, left, of Serbia, makes a move against the Nets' Jared Dudley, right, during the first half in Game 1 of a first-round NBA playoff series, Saturday, April 13, 2019, in Philadelphia. 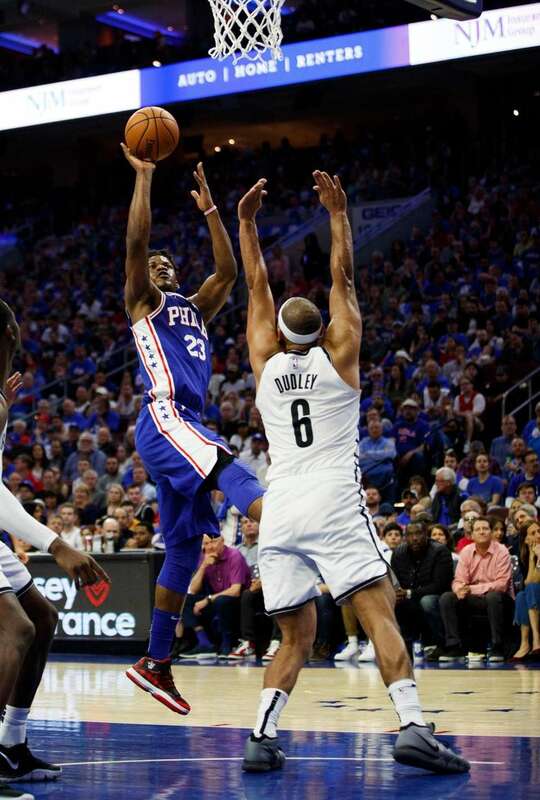 The 76ers' Jimmy Butler, left, shoots over against the Nets' Jared Dudley, right, during the first half in Game 1 of a first-round NBA series, Saturday, April 13, 2019, in Philadelphia.